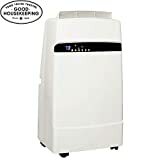 Whynter - ARC-12SDH : Portable Air Conditioner Review • The Air Geeks, reviews of air conditioners, dehumidifiers and air purifiers. The ARC-12SDH is a dual-hose portable air conditioner that is designed to provide your office, bedroom, living room, et cetera with cool and fresh air. This unit features a heater and auto-drain technology to ensure that your room gets a truly comfortable environment. Furthermore, this air conditioner offers three operational modes. Are you looking for an air conditioner that will transform the environment of your room? The ARC-12SDH offers many impressive features to enable you to achieve the desired environment with ease and convenience. If you are planning to buy this unit for you house, you are most certainly searching for reliable information about its features, strengths, and weaknesses. If that is what you are looking for, we have gathered information about this air conditioner to help you make a wise decision. The ARC-12SDH is a sleek air conditioner that offers a cooling capacity of 12,000 BTU. This cooling system combines many impressive features to provide your room with cool and fresh air. This dual hose system offers three operational modes: fan only, cooling, and dehumidifying. Regardless of the outside weather, this air conditioner ensures that your house has a comfortable environment at all times. This air cooling system is suitable for server rooms, living rooms, workshops, bedrooms, and computer rooms to mention a few. According to Whynter, the ARC-12SDH is suitable for rooms that are as large as 400 square feet. Are you looking for an air conditioner for a room that is less than the recommended space? If your answer is yes, then this air conditioner is a suitable option. Nevertheless, it is important to note that ventilations can have an effect on the effectiveness of your air conditioner. 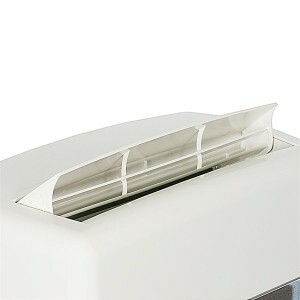 The ARC-12SDH recycles the captured moisture to cool the air in your room. This auto-drain technology minimizes the accumulation of the condensate and enhances the overall efficiency of the system. The three operational modes help you to achieve your desired environment. If you select the cooling mode, the unit cools and dehumidifies your room. The dehumidifying option dehumidifies the room without cooling. Lastly, the fan mode offers 4 fan speeds and circulates the air in your room. A good point in our review – duely noted by the Air Geeks. The dual hose design of the ARC-12SDH enables your room to achieve the desired environment within a short time. It uses the two hoses to draw warm air that is cooled to provide your room with cool air. Warm and humid air is expelled through the exhaust hose. The window kit is designed to fit in most standard windows. With minimum modifications, the window kit can also be fitted in dropped ceilings and wall openings. Apart from cooling and dehumidification, the ARC-12SDH is also capable of trapping particles and removing bad smell. The activated carbon filter is responsible for ensuring that your room gets odor-free air while the pre-filter traps airborne particles. Are you looking for an environment-friendly cooling system? The ARC-12SDH is an environment-friendly system that consumes minimum energy and uses ROHS compliant components. This air conditioner uses the ozone-safe R-410A refrigerant. Are you intending to use this air conditioner in a quiet room? From our research, we have noted that this unit is noisier than most units of same or higher capacity. It is therefore an unsuitable choice for quiet places such as bedrooms and offices. Features a heat pump. 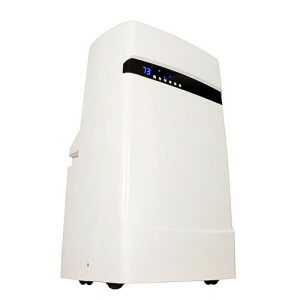 This heat pump is suitable for heating the room when the outside temperature is higher than the inside temperature. However, when the outside temperature is low, the system does not work well and a heater is an ideal solution. Easy to unpack and install. With the help of the user manual, it is easy to install this dual hose system. Effective cooling. When installed in a right-sized room, this air conditioner provides the room with cool and fresh air. It cools a room quickly. Relatively loud. Compared to most air conditioner of equal capacity, this unit is louder. It may not be a suitable option for use in quiet places such as bedrooms. Poorly designed. This air conditioner is not strongly built. Many cases of units breaking after running for a short time have been reported. Had a need to cool a 380 sq ft study/workroom at our summer home with day time temperatures between 72F-88F. Central air conditioning available but extremely wasteful in a 2500sq ft house. Refused to consider window given prior bad experience (let's just say it took a long fall). This would be my 2nd Whynter portable in less than 10 years. My first one was an odd looking unit that worked wonderfully for years before we gave it away when we had to relocate to overseas. The shape and design of this unit was agreeable and generally understated. The only hint of technology was the display LCD band that runs along the top half of the a/c. Standard size for a portable and a hint bulkier given the dual hose design. Although termed portable, it is not something you can carry around the house with one hand. Installation was uncomplicated and the user manual was adequately helpful in completing the window exhaust setup. Understanding the display indications was initially confusing but a quick flip of the user manual was enough to get me comfortable. Remote control is simple and good to at least 15 feet away. I powered it up during a warm afternoon. I was duly impressed. Sometimes, powerful is probably not the right word. The unit had sufficient fan speed but the actual coolness of the air from the unit was what made the difference. It was exceptionally cold. I was comfortable in a matter of minutes and had actually feeling cold in less than an hour. It's relatively quiet and I've not been bothered but it whatsoever. Several weeks in and it has been performing to expectations." We bought this back in September and took it out again recently for the heater function. Nicely designed unit that has a clean modern look. The display is a concealed LCD band that is simple and understandable without an overload information and meaningless statistics. Although easy to roll around, be sure to get help when lifting up above a foot. The window kit was good quality and overall setup was considerably easy. Just hookup the hoses to the kit and fit the kit snugly into the window opening. Cools wonderfully. I use it specifically in the baby's room and occasionally in the study. The dual hose design helps with the energy efficiency and overall cooling or heating out. Both rooms are about 18x18 and this unit has no problem cooling down a 95F room to a comfortable temp in less than 30 mins. I'm surprised that the cooling throughput of this unit is actually 20%-30% faster than another 14000 BTU that I have. Nothing scientific but even my wife notices the significant difference. The heating option is not for heavy duty heating but it works perfectly as a spot heater when you don't want to crank central heat up too much. To sum it up, this is a surprisingly efficient unit albeit slightly bulky but gives great bang for the buck." The ARC-12SDH is a multi-purpose air conditioner that ensures that your room has the desired environment. This environmentally friendly air conditioner offers many impressive features such as a cooling capacity of 12,000 BTU, inbuilt heat pump, and a dual hose pump design. In case you are looking for an air conditioner for your bedroom or office, the ARC-12SDH may not be the best solution for your cooling needs. This unit produces a loud sound that may be disturbing if it is placed in a quiet place. Furthermore, this unit is poorly designed and lacks ruggedness. If none of these cons is a bother to you, and you are still seduced by Whynter winds is the midst of summer, then the ARC-12SDH could be a good option for your cooling needs. This air conditioner costs $ 540.